Spray 4- to 5-quart slow cooker with cooking spray. In cooker, mix squash, apple, onion, cinnamon, nutmeg, salt and pepper. Pour broth over vegetable mixture. Pour about 3 cups of the soup mixture into blender. Cover; blend until smooth. Pour into 8-cup measuring cup or heat-proof pitcher. Blend remaining soup mixture in 2 more batches; pour into measuring cup. 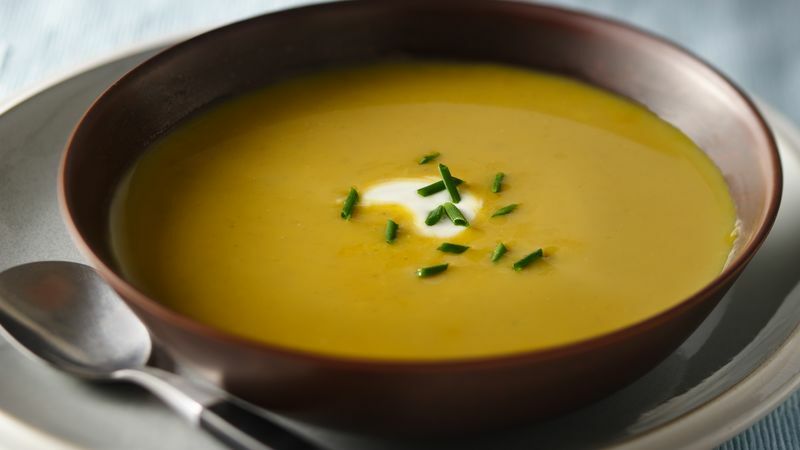 Pour pureed soup back into slow cooker. Stir in half-and-half and syrup. If needed, increase heat setting to High; cover and cook about 15 minutes longer or unto hot. Top each serving with yogurt; sprinkle with chives. Look for already peeled and cut-up squash in the produce section of your grocery store. A good, swivel-headed vegetable peeler is the tool of choice to make quick work of peeling the squash.